You can't travel to other planets or other times — not yet, anyway. But there are plenty of great landmarks from science fiction and fantasy that you can visit, right here on Earth. Here are 10 great fannish tourist destinations. We asked the awesome people on io9's Facebook page what their favorite "fan pilgrimages" were, and here's what people said. Did we miss your favorite landmark? Let us know in the comments, or over at the Facebook page. Top image: Jeffrey95112 on Flickr. Visit the location of Torchwood's secret entrance, as well as the area where so many Doctor Who scenes have been filmed — Cardiff Bay has stood in for all sorts of locations in the new Who. But mostly, you'll just have hours of fun trying to locate the hidden entrances to the Hub. (Thanks for the suggestion, Michael.) Photo by GivingNot on Flickr. This hotel was the inspiration for Stephen King's original novel of The Shining — and the actual miniseries version was filmed there. Adds Scott Clark, "Doesn't hurt that Estes Park is a great place to vacation!" (Although many people do believe the Stanley Hotel is haunted in real life, and have reported hearing eerie piano music in the distance while staying there. So be warned!) Photo via WallyG on Flickr. 8) The Bradbury Building, L.A.
Not only is this one of the most famous retro-futuristic buildings of all time, it's also a huge film location. Most famously, it's used a lot in Blade Runner, as the home of J.F. Sebastien. But it also makes huge appearances in The Outer Limits, Quantum Leap, Pushing Daisies, and the movie Wolf. (Thanks, Mark!) Photo by DB's Travels on Flickr. 7) The Circle K from "Bill & Ted's Excellent Adventure"
This is the location where Bill and Ted try to write their history report by asking the shoppers questions about history — and where they first meet Rufus. And it's located at 1094 West Southern Avenue, Tempe, Arizona. (Thanks, Ryan!) For bonus points, go to the Circle K dressed up as Bill and Ted. This is where Twin Peaks was filmed, and it's a great place to creep yourself out. Says David Flowers, "Every time I go by the abandoned railroad cars I get freaked out..." Great locations include the giant log and the Great Northern (which is at Snoqualmie Falls.) Photo via Knitgrrrldotcom on Flickr. Visit the grave of H.P. Lovecraft: "That is not dead which can eternal lie and with strange aeons even death may die!" There are also a couple other Lovecraft plaques and commemorative signs around town. Plus you can visit all of his haunts, including the library where he did a lot of his writing. There's even a Lovecraft walking tour, on occasion. (Thanks Drew!) Photo by Rianap on Flickr. This is the castle that portrays every single castle in Monty Python and the Holy Grail, because the British authorities withdrew permission to film at other castles at the last moment. (Thanks Robert!) Photo by Garzhia on Flickr. Not only is it the Village, the mysterious location where the Prisoner became trapped in a nightmarish false utopia, but Portmeirion is an architectural marvel in its own right, designed to show how a town could be built without spoiling nature. And it filled in for Renaissance Italy in the Doctor Who story, "The Masque of Mandragora." And it looks like they were filming there again recently. (Thanks Steve!) Photo via the Farnsworths on Flickr. You can't visit the Enterprise, but you can visit the location where many of Star Trek's greatest episodes were filmed. This is where Kirk fought the Gorn. But also where Picard had to learn to understand about Darmok. Most recently, it appeared in J.J. Abrams' Trek movie, and the spoof Paul. Keep your eyes peeled for other visitors reenacting scenes from the episode (like here and here and here and here.) (Thanks Neil!) Photo via T. Hoffarth on Flickr. 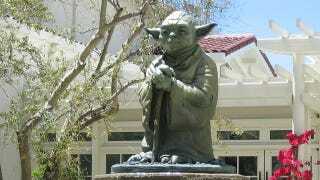 Find serenity while gazing at this Yoda statue, you will. (And you can gaze at the offices of Lucasfilm, where the Minions of George toil surrounded by memorabilia.) This statue even has its own Yelp page! (Thanks to Robert for the suggestion.) Image via Redgoober4Life on Flickr.